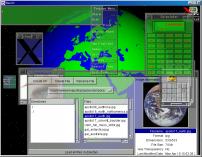 WeirdX is an X Window System server in pure Java under GNU GPL. 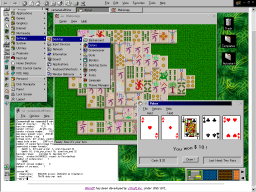 It is derived from WiredX-Lite and will run on any platforms which support Java 1.1. This X server will not be suitable to exec heavy x clients, but you may find that twm, xterm, etc. will run fine on it. WeirdX handles x protocols directly. WeirdX supports core protocols of X11R6.3 partially. WeirdX is implemented with JDK 1.1. WeirdX runs as an application/applet. WeirdX runs as a TrueType font X Server if your JVM supports TrueType fonts. WeirdX supports the three mouse button emulation. WeirdX supports copy/paste operations between the native window system and x clients via CUT_BUFFER0. WeirdX supports 1bpp, 8bpp and 16bpp mode. WeirdX supports multibyte characters; Japanese, Korean and Chinese characters. WeirdX allows you to get secure X accesses in pure Java by using JSch. WeirdX supports dxpc(Differential X Protocol Compressor) with the assistance of JDxpc. WeirdX includes hacks for the alpha transparency. WeirdX supports EsounD compatible applications. WeirdX includes the XJS Extension written by Christian Werner. WeirdX is distributed under GNU GPL. WeirdX is not WiredX(please refere to section 1.5 in FAQ). WeirdX allows you to get secure X accesses via SSH2 X11 forwarding in pure Java. This functionality is based on JSch, which is a pure Java implementation of SSH2 and developed by JCraft under revised BSD license. Please refer to 'SSH2 X11 Forwarding in Java' section in INSTALL file. Two hacks for the alpha transparency have been added. By one of them, backgrounds of windows become translucent. The alpha transparency may not be the essence of the window system. But everybody loves the translucency! So, this hack has been done! Please don't expect too much of this hack. This hack is just for the fun, not for the practical use and they will be useful for surprising your friends. We greatly appreciate these goodies. README.XDMCP, written by Valentin Pavlov. http://garuda.medinfo.m.ehime-u.ac.jp/2001/weirdx/index.htm, written by Eizen Kimura in Japanese. http://garuda.medinfo.m.ehime-u.ac.jp/2001/weirdxonweb/index.htm, written by Eizen Kimura in Japanese. http://fox.zero.ad.jp/~zau36341/weirdxuse.html, written by cow@Cow Project Workshop in Japanese. http://www.din.or.jp/~shimaden/tips/pc/tip0004.html, written by Hiroyuki Shimada in Japanese. http://www.macorchard.com/server/WeirdX.php, written by Drew D. Saur. This page has described instructions for using newest WeirdX on the Mac OS. If you want to try WeirdX as soon as possible and don't need the source code at the first time, just download 'weirdx-*.jar' and run it; 'java -jar weirdx-*.jar'. Two mailing lists about WeirdX are kindly hosted by SourceForge. This list deals with announcements of new releases. This list deals with everything related to WeirdX, it's usage, installation, questions and suggestions.